The Sewing Directory included us in their recent Top 10 article. Thanks so much, Fiona and Beth! You can find some excellent resources on The Sewing Directory. Make sure you have a look around this fabulous UK-based site while you’re over there. 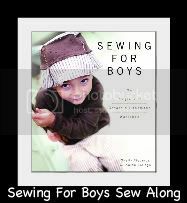 Stacey from Oh Boy, Oh boy, Oh boy crafts is hosting a year-long sew-along starting on January 1, 2012. She has some prizes lined up for each month’s creation, and will be sewing for her three boys. There are some rules to the contest which you can read by clicking on the sew-along logo below. We hope you’ll join her. I know what we’ll be sewing all year! Karen LePage & Shelly Figueroa Please link to this site as often as you like, but don't use any images or content without our written permission. Thanks!